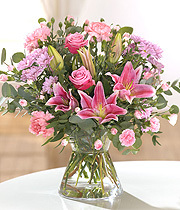 A mix of beautiful Stargazer Lillies, Roses and the best flowers available. This bouquet can be delivered in a gift box or a glass vase. This bouquet can be ordered in REGULAR (a super fresh mix of flowers), SPECIAL (a larger bouquet with a more or those gorgeous roses!) or LUXURY ( for a special occasion or that special someone, push the boat out with a luxury bouquet in a glass vase).